Cinco de Mayo is right around the corner, and any excuse to make Mexican food is reason enough to do it. So… let’s make tostadas! A good tostada needs a good salsa. While freshly homemade salsa is best, it’s April, so that’s not really feasible. Tomatillos aren’t yet in season. There are some good pre-made salsa options, and if you’re in a bit of a time crunch, that may be your best option even if you’re making this dish in August. I chose a variety I knew from experience had good flavor with a bit of heat. A caveat — this tostada recipe isn’t as authentic as something you’d find in a Mexican restaurant. It’s still really tasty, though. This meal is medium-hot on the spicy factor — the perfect reason to pair it with beer. A lighter style is your best option, be it lager, wheat, or pale ale. I opted for Lost Coast’s Tangerine Wheat. Its sweetness and crispness complimented the fatty chorizo and tempered the heat from the green salsa and the meat. Preheat a pan over medium heat. Cook chorizo until browned on all sides, breaking into small chunks as you stir. While chorizo is cooking, add salsa, cilantro, and avocado to a bowl and mix well. Crumble queso fresco into another bowl and set aside. Drain cooked chorizo onto a plate lined with lots of paper towels in order to soak up the extra grease. Set aside. Heat your stove top grill over medium high heat. Place six tortillas on the grill, turning every 30 seconds until they begin to brown and puff up. Sprinkle chorizo onto the top of each tortilla. Allow the meat to warm and the tortilla to crisp. Remove from heat and repeat the process with the other six tortillas. 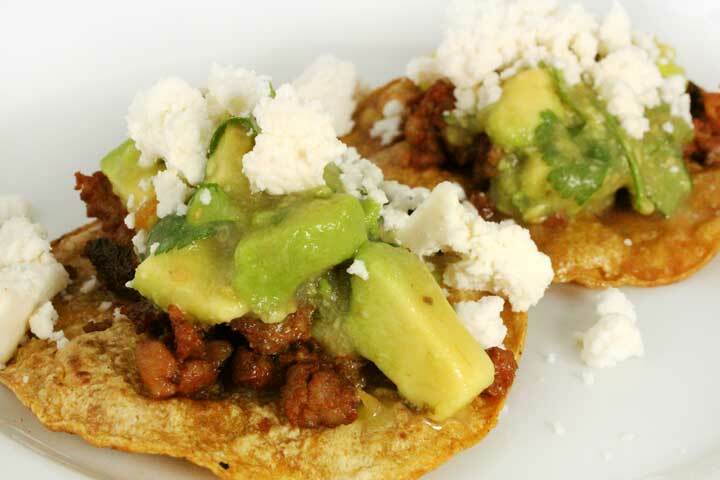 Sprinkle each tostada with queso fresco and then drizzle with the salsa mixture. Serve with your beer of choice and plenty of napkins.